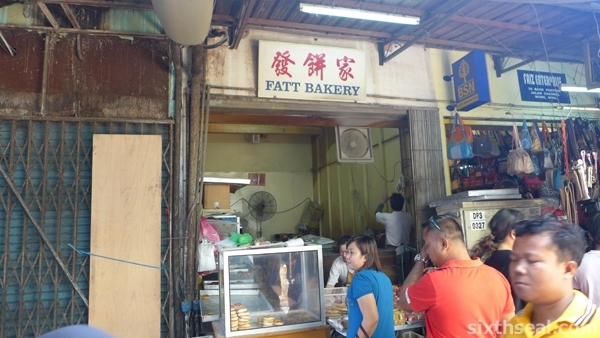 Fatt Bakery – best kompia in Sibu! Well, or so my dad says. Haha! Everyone has their favorite kompia stall. 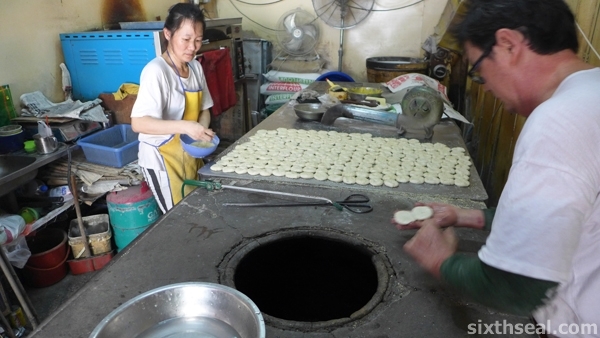 The humble kompia is a bagel-like pastry that supposedly was strung around the neck of soldiers back in China (coz they have a tiny hole in each of them, like a donut) and eaten for sustenance in the battlefield. I don’t know about that but people in Sibu have been snacking on them for ages. 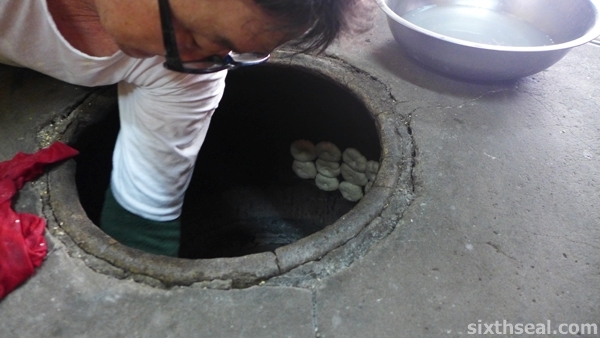 Fatt Bakery still does their kompia the old school way – slapped around a brick oven. It’s cooked by the ambient heat from the brick/stone oven – a lot of places uses a regular, modern oven now and it tastes totally different. Fatt Bakery does have one tasty new innovation though – buttermilk kompia! 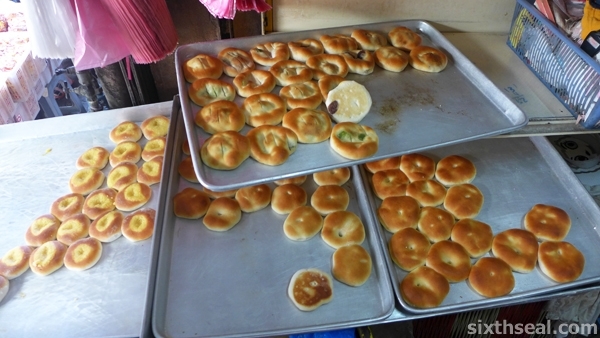 The sweet filling is placed inside the regular kompia and it sells for about 30 cents each (RM 2 for 6 pieces). Look at how it’s made to the left of the photo above! They also have pandan, custard and coconut flavors. Kompia actually only refers to the sesame seed covered, slightly salty variant. The larger and sweeter version is called chu nu piang. I loved this as a kid while my sister preferred the chewy kompia. Fatt Bakery does a brisk business though. There were people waiting in line to get the kompia while the husband and wife team prepares them in the open bakery. I had to walk around a bit to find it but it’s *opposite* the Sibu market, near the pork section. My better half loved the buttermilk kompia too! I’ve seen this place before… from some Taiwanese travel documentary, would love to try these out! I didn’t know it came out in some Taiwanese documentary. Yeah, it’s good, you should check if out when you’re in Sibu! He goes to the Rejang Park one which our family used to like, but now prefers this one in town (which is further but worth the trip). You should try both and see which one you prefer! There’s also another on in Sungai Merah that’s really good. No, Claire…we went to the one that I think is the best in Sibu – at Rejang Park, not this one. However, found out their quality is inconsistent so we went to the one in town (Fatt Bakery) instead. There’s also another one in Sungai Merah which I find is quite good! There’s two in Sungai Merah actually, one is owned by a friend’s dad but the other one is better. Haha. Kompia!!! I had them when I visited my friend in Sibu a several moons ago. I can’t remember the name of the place I had it, though. Her parents took us to this place in the center of a park (there are lots of fancy carp in the lake…lots of fishes!) 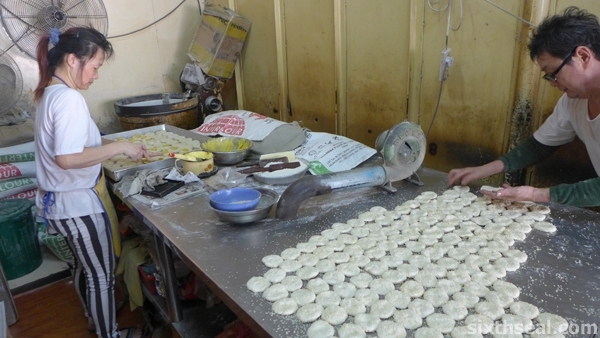 where the bakers make the traditional kompia – plain with sesame seeds and also some with meat and bak gua! I bought a whole bunch back to Penang with me and my dad loved it. Is the place quite far from town (about 30 minute drive) and it’s in the middle of a real park e.g. lots of trees and a huge pond for carp where you can buy feed to feed? The other place I know which fits the description is in town but I won’t call that a park per se. Yup, it’s best eaten with meat! I think the type you grew up eating becomes your favorite! I love the soggy ones with meat in the middle and *soaked* in gravy. Come along, we’ll bring you out! Hey HB, that sounds about right. It was a long drive and the surroundings are very quiet, not town-like at all! And yup, we bought feed to feed the carp! That’s the kompia my friend found to be the best in Sibu. I had a great time there – all the Fuchou food was new to me, will definitely go back for a visit. When I do, I’ll look you up! They have good kompia too! I went once (took MC from work and just went there to chill one day hahaha) and ate their kompia. Just buzz me whenever you’re in town, we’ll take you around! Must remember to get more of the buttermilk ones next time! It’s a good fusion kompia. Haha! I have eaten kompia before but it’s brought by a friend in Sibu. However, it was already all cold and not warm, so would that make a difference cos I didn’t find it that nice. You can ask for it when they’re actually baking it, just take the ones as soon as they come out of the oven, but it’s really hot. Ours was still warm after a few hours but you gotta let the plastic bag “breathe” by not tying it up or everything will turn soggy, maybe that’s the problem? I super love the buttermilk kompia.. tried all the flavours and I love the buttermilk most.. the fresh from oven kompia is also very nice.. i can have many of them at a time and felt full till cannot move after that.. hahahaha !! I agree, fresh from the oven is the way to go! The ones we got was still warm when we got home. The trick to good kompia is to let it breathe so don’t tie up the plastic bag, just leave it open else the steam won’t be able to escape. Too bad I only saw your comment or would have passed you some. We gave some away coz it’s something that’s unique to Sibu and can be quite delicious on it’s own.